Kitchen safety coloring books can be powerful tools for educating children about how to avoid getting injured in the kitchen. The sooner children learn how to follow proper safety procedures in the kitchen, the less likely they are to experience problems with stove or oven burns, accidental ingestion of chemicals, consumption of tainted food or other common kitchen safety issues. Coloring books are an excellent educational tool for young children. The act of coloring helps make safety concepts very real for youngsters who are not yet old enough or mature enough to grasp intangible concepts or understand hypothetical situations. It can be difficult to get children to understand the consequences of unsafe behavior just by talking with them. However, the act of seeing and coloring illustrations about proper safety and the consequences of acting carelessly helps youngsters grasp the cause and effect relationship between their actions and kitchen safety. Whether you are a school teacher hoping to educate an entire class of youngsters about kitchen-related safety issues or you are a parent looking for educational activities for your own kids, coloring books can make it easy for you to share valuable lessons that will have a lifelong positive impact on the children in your care. You can find free downloadable kitchen safety coloring books and coloring pages on many government, university and association Web sites. Food safety is one of the most important kitchen safety lessons. The United States Department of Agriculture (USDA) has an online food safety coloring book that helps children understand many important safety lessons related to food handling and consumption. Illustrations include: hand washing, the importance of keeping hot foods hot and cold foods cold, proper food storage and transportation, how to was produce, and more. The USDA's Food Safety and Inspection Service (FSIS) also has an online kitchen safety coloring book that emphasizes the importance of things like proper refrigeration, separating different types of foods, using a meat thermometer, and more. FSIS uses the cute and engaging character Thermy to teach kids about the importance of food safety. The Virginia Department of Agriculture and Community Service offers a downloadable food safety coloring book that kids will enjoy. Each image has a food safety rule printed at the top of the page, for increased impact on safety education. As a parent or educator, you are responsible for doing everything you can to teach the youngsters in your care about how to stay safe. You also have to help them begin to build a foundation of common sense that will enable them to become productive, self-sufficient adults. That's why coloring books can be so beneficial for safety lessons. 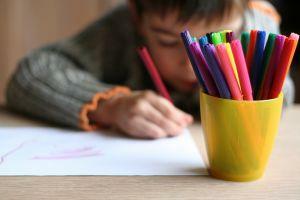 Of course, coloring books can't replace verbal and hands-on lessons about household safety. However, they are excellent supplemental activities. Coloring books that emphasize educational themes are great tools for reinforcing lessons. When kids are coloring safety illustrations, they are actively engaged in the process of learning lifelong safety lessons. Most children enjoy coloring, and find the activity much more interesting and entertaining than listening to lectures about safety. Sometimes the most significant lessons are learned when kids just think they are having fun.